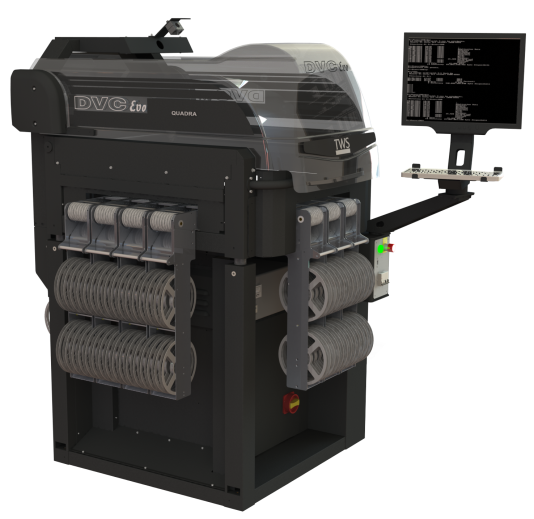 New SR3200EVO stand alone fully automatic printer with fiducials automatic recognition and external loader/unloader pairing capability. A new chassis grants improved features of stability and rigidity. Can be coupled with LD100 automatic loading system to build an optimal solution to maximize printing throughput. Printing mode is motor assisted (brushless motor) and fully programmable. An easy-to-use software guides the operator during the whole process. Compact design to save space, large printing area, first class specifications make this printer a product with an outstanding quality-price ratio. If you are a newcomer to SMT, the simple and reliable design of QUADRA DVC EVO is the perfect choice. The large customer base of over 1.300 units of Quadra installed and working all over the world is the best proof of our successful design. QUADRA DVC EVO gets improved features capable of satisfying the needs of the most demanding assembly line. Vibration free high speed brushless motors. High Resolution Full color camera. Linux OS for dependability, full connectivity, fast start-up and program changeover, lower-cost of maintenance in the market. Mixed products and small batches are not a problem: Quadra can handle several types of components such as standard SMDs, metal domes, TH LEDs and can be easily customized. Worldwide service and support. Low cost spares. You always get a fast and effective help whatever are your necessities. TWS 1385 EVO is an innovative medium-size convection oven which has an outstanding quality-price ratio. The TWS 1385 EVO is 3 metres long (with a 2 metres tunnel) and produces a very good soldering profile, together with high productivity with low power consumption. It is also very easy to use. 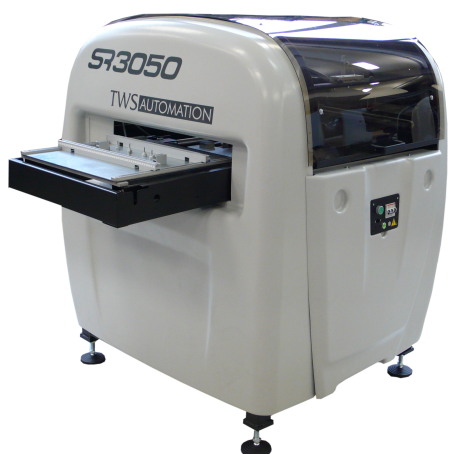 The TWS 1385 EVO is divided into four heating zones, three for preheating and one for reflow. The air convection is directed horizontally by fans that blow the air from the centre of the zone to the surroundings. The window in the hood of the machine enables the user to observe the reflow process in real time, giving useful indications and allowing for thermal profile fine-tuning without using the recorder. The upper part of the soldering tunnel has a flip-opening system that enables an immediate inspection and cleaning. The air temperature is controlled by a microprocessor through K-type thermocouples placed in each zone, that keeps the temperature between tight limits. The cooling zone is optimised to lower the temperature to the required level without causing unwanted thermal shocks either to soldering joints or to components. To obtain the best soldering performance, the oven is equipped with a temperature recorder which can be connected to a PC to display the temperature profiles during the soldering process. A great variety of thermal profiles can be obtained ( to fulfil even the most complex demands) due to its four heating zones and the digital adjustment of the conveyor speed. The heating elements are controlled by a PID regulator using Burst Firing commutation, complying to EMI standards. Programs can be stored and quickly loaded. In the event of a power failure, a back up battery enables the conveyor to continue running until all boards have exited the machine. It can be equipped with a support bench (solid wheeled legs) sold as optional.